I remember when first base was manned by Donnie Baseball, the New York Yankees followed him up with Tino Martinez and Jason Giambi. After Giambi started breaking down we were treated to Tony Clark, Andy Phillips, Wilson Betemit, John Olerud and John Olerud’s batting helmet along with one misguided reunion with a 37-year-old Martinez. In 2009, Mark Teixeira signed and had 1 good year, two mediocre years and one “meh” year, unfortunately for the Yankees he played a total of nine. Since then we’ve had the Greg Bird injury experience, Garret Jones, Rob Refsnyder, Tyler Austin and Luke Voit. Yet, this offseason there has been no mention of the black hole at first base. Some may be comfortable with the Luke Voit and Greg Bird tandem, but I’m skeptical about Bird ever being healthy and good at the same time, and I don’t think Voit’s Roy Hobbs impression can be sustained. Will Andujar continue his success at the plate? Miguel Andujar’s defense has been the cause of a lot of hand wringing this off-season, and has caused a lot of people to overlook the fact he hit .297 with 27 home runs and 92 RBIs at 23-years-old. Another thing that’s overlooked is his 47 doubles, and what that number predicts. Scouts used to believe that as a player grew into his body and learned to hit at the major league level doubles were a sign of developing power. Sabremetrics has validated this fact, and typically young players will see a decrease in doubles (typically balls hit into outfield gaps) as they learn to pull and drive more pitches out of the ball park. There is no reason not to expect to see Andujar follow this same path and have his doubles drop down into the low 30’s, and to see his home run totals shoot up into that same area. I think Andujar ends up a .270-.280 hitter with an OBP around .330 who averages out at 30 HRs and right around 100 runs batted in each season. That’s a valuable player, particularly when he’s 5-years from being anywhere near free agency and you have Aaron Judge, Luis Severino and Gary Sanchez all to come. Trading him for equal value seems unlikely when you take in the full picture, so what do you do with him? Maybe his defense improves and you leave him at third, but improvement would take him from terrible to just bad and I don’t think below adequate is the Yankees’ goal for him. First it give Andujar a home, ends the trade speculation and allows him to settle in and just hit. Second it opens up the Yankee infield to multiple options with LeMahieu, Torres, Gregorius, Tulowitzki and whoever else they bring in. Finally it lets Yankee fans spend next offseason reliving the Machado let down with Nolan Arenado as the free agent who totally wants to be in NYC until he doesent. Everyone’s a winner in this scenario so let’s do it Yankees, lets break the cycle of first base futility with a young home-grown star. Just to be safe though, it wouldn’t be the worst thing to perform an exorcism at first base just in case. 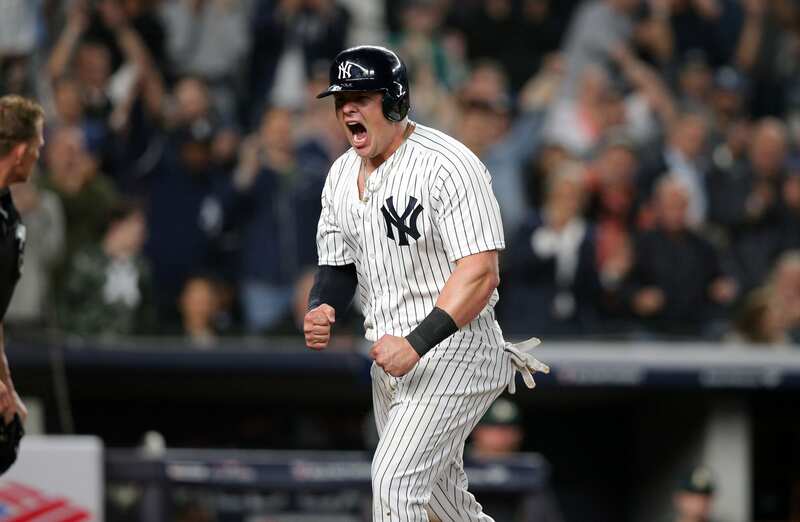 Can The New York Yankees Compete With The Boston Red Sox In 2019?